YBONNE New Slim Wallet with Money Clip Finest Genuine Leather RFID Blocking Minimalist Men's Bifold | What Should I Say? YBONNE brand of sleek, minimalist design wallets offers you functionality, sleekness and durable performance. Made with the revolutionary crazy horse leather, our minimalist wallet offers not just beauty and elegance, but the unbeatable functionality you desire in a high-quality wallet. The premium crazy horse leather retains its unique appearance and strength with passing time and under the most rigorous conditions of use. Holds your driver's license, debit/credit cards, and money notes with high integrity and also gives protection against NFC-equipped smart phones and scams with the RFID Blocking lining which keeps your data safe. So, while in transit, you do not need to feel distressed because our wallet keeps your card data free from unwanted access by Cyber-thieves and fraudsters. Our wallets come nicely packed in an adorable gift box, so you can easily gift it to your loved ones on their special day. YBONNE use top quality leather only. We have selected the best taste of color for each type of premium leather. Suitable for gifting your male friends and relatives on their birthdays, fathers' day, weddings, or other celebrations. Grab your wallet and explore new horizons! ✅ THIN MINIMALIST LIGHTWEIGHT DESIGN: New premium men's wallets Measuring 4.3" x 2.9" x 0.35" weigh 1.84 oz fit in your shirt and pants pockets and hold a bit of cards and money. Say goodbye to bulging, unattractive wallet-in-pocket experience. Enjoy sleekness on a new level. ✅ 100% PREMIUM GENUINE CRAZY HORSE LEATHER: Made of high quality genuine Crazy Horse leather treated with vegetable oil. Crazy horse leather is durable, strong and gives an unique look and feel, which combines luxury, antique and vintage appearance. ✅ FUNCTIONAL 8 COMPARTMENTS + MONEY CLIP: Our smart compact wallet boasts a metal money clip for keeping your money secure in your wallets. It has multiple slots for cards and other contents: 1 easy access front pocket, 1 outside ID pocket, 4 inside pockets, and 2 more inner pockets. ✅ SECURE RFID BLOCKING WALLET: Our wallet is equipped with superb RFID blocking attributes. We added a silver coating to prevent cyber harassment and identity theft. Blocks 13.56MHz frequency signals for maximum safety of your private information. ✅ ONE YEAR WARRANTY: Our wallet is designed to give you maximum satisfaction. 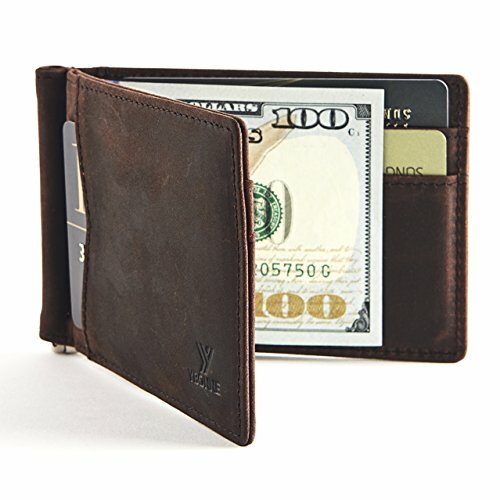 We promise a replacement or full refund if there is any problem with the quality of the wallet. Feel free to contact us with any complaints or assistance. If you have any questions about this product by YBONNE, contact us by completing and submitting the form below. If you are looking for a specif part number, please include it with your message.